Night before last my beloved Nokia 3650 was nicked - cast off into the world naked and alone but for its handsome purple faceplate. Well, it was time for a new phone, anyway, but I'd been holding off in hope of finding a device whose capabilities were sufficiently beyond the 3650 to justify what would no doubt be a hefty price. 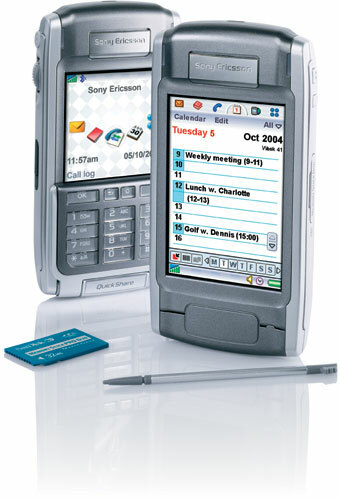 I've been sorely tempted by the Sony Ericsson P910a. There's a little mobile import shop down the street from my house that offers the phone for 500 bones with service. If I had 500 to spare I might have bought it by now. But frankly I'm not sure the P910, strong as it is, offers five hundred dollars worth of additional capability over the seminal 3650. And make no mistake, the 3650 is, to Nokia's credit, a seminal device. If the P910 had greater resolution in the camera, or capacity for greater bitrate - 3G or even EDGE - then, it would be worth it to me. But it doesn't. And there is the issue of UIQ as it currently stands. It seems obvious that a smartphone is neither smart nor a phone if it requires use of both hands for many of its major functions. Even in a smartphone that has a stylus, use of two hands should be mostly optional. Word has it, in fact, that the upcoming version of UIQ will address this very thing. My thinking was that we could surely expect such refinements and enhancements in the next iteration of the P series, probably this year. So I was holding out for that, or something like it. Until, as I say, night before last. The theft of my phone left me flat-footed. Low on cash, I needed a replacement and needed it fast. The T-Mobile device lineup in the US is pretty lackluster. The best on offer - Nokia 6600, Palm Treo 600, and a few Blackberries - is ridiculously expensive for what these devices can lay claim to. What I really needed to buy was time - time to look around, save up funds, and wait for something worthwhile to appear. Meanwhile, however, I had to have a phone. In a big hurry this past Friday, I went for cheap and basic and picked up a Nokia 6010. Big mistake. The 6010 must be one of those phones where the manufacturer's sole criterion is "cost of goods". The RF is poor, and the sound quality likewise, sounding distinctly digitized. (I had to turn the volume to maximum in order to understand what was being said.) The microphone, meanwhile, picks up a great deal of background noise, so much so that my callers commented on it. Because of the poor quality mic, I couldn't even use T-Mobile's (otherwise dreadful) new voice response automated attendant while on the bus - the background noise discombobulated it. And, given the 6010's limited functionality, it's quite large and bulky. The phone does offer the usual menu of functions found in Nokia devices - address book, organizer, and so on; but in a form factor like this one, these are functions in name only, and an exercise in frustration. Note to Nokia: there is a wide swath of people in North America who want or need, for whatever reason, a basic phone. A basic phone should offer the following. And that's all it should offer. If you can't get that right - and this is the thinking of users - could you be expected to get anything right beyond that? I mean, if the 6010 were my first experience of Nokia, I'd probably never buy another of their products. Simple. Looking on T-Mobile's website, I noticed the Sharp TM150. Offering a megapixel camera, stereo MP3 player, and use of MMC/SD cards of up to 512 MB, this flip phone appealed to me. The camera was a clear improvement over my 3650, I'd be able to use my existing MMC cards, and the price - $49.99 - made it a real bargain. Turns out, however, T-Mobile's advertised policy of honoring new customer prices for existing customers with expired contracts, is not quite real. My price for this phone, T-Mobile told me, was $100. What happened to $49.99? I wanted to know. Well, actually, they said, we have two sets of discounted prices - one for new customers, and one for those already on the hook. After further discussion, I got this price down to $80 - which seemed fair. All I'd have to do, to get this phone at this price, was return the 6010 to the store, beg for a loaner, then wait for the TM150 to arrive via courier. Great. As good as done. Then I started thinking how T-Mobile's service has never worked inside my house. (I moved here late last year.) There I am, Mr. Mobile Phone Enthusiast, having to step into the yard, rain or shine, to make a call. It's only due to T-Mobile's generally good customer service that I've put up with this. But enough is enough - and off to Cingular I went. Of the phones for under $80 offered by Cingular, the Sony Ericsson Z500a stood out. A stylish, EDGE-capable flip model, this phone looks, at first blush, like just what the doctor ordered. In this case, however, the doc works for Cingular - as I'll explain in my next post.